Periodontal disease, commonly referred to as ‘gum disease’, is disease that affects the periodontium. The periodontium is the hard and soft tissue that surrounds and supports the teeth, including the gums, ligaments and the jawbone. When inflammation of the gums occurs, often leading to bleeding of the gums. The damage caused by gingivitis is reversible and gingivitis is quite easily treated. A more serious, severe type of gum disease. It affects not just your gums, but also the soft tissues and the bone that our teeth sit in. The bone loss caused by peridontitis is irreversible and can lead to loss of teeth if not treated. 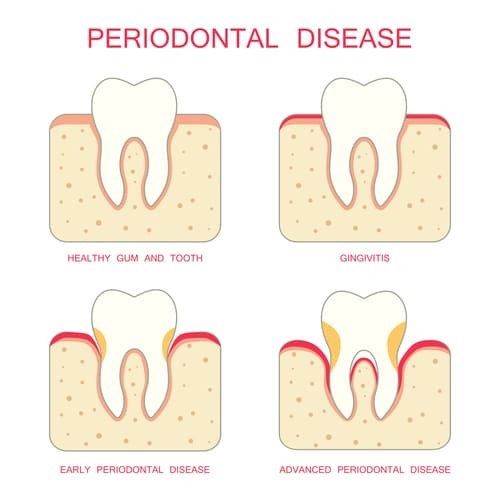 In order to diagnose the severity of your periodontal disease, we will ask about your medical history to see if you have any of the risk factors (such as smoking) and the conduct an examination of your gums. We will also use a ruler to check the depth of your pockets. We may also take x-rays if we feel it is necessary. An extremely careful scale and clean combined with sound home dental care and hygiene is the most essential part of out periodontal treatment. For gingivitis, one or two visits for a scale and clean is often all that is required, as long as home care instructions are followed properly, it’s what you do at home that gives your gums the best chance of remaining healthy. If you do have periodontitis, then you will need a deep scaling and root planing procedure. This can be rather uncomfortable so it will usually take place over 4 to 6 visits using local anaesthetic. If you have more severe periodontitis, then we may recommend laser dentistry as well as antibiotics in conjunction with the scaling and root planing. At the extreme end of the scale, a referral to a periodontist will be given, as surgical intervention may be necessary. If periodontal disease is caught and treated in the early stages, it can be a very simple process. If it is allowed to progress the consequences can be incredibly serious and require intrusive and expensive treatment procedures. Remember, the bone loss caused by advanced stage periodontitis is irreversible and can lead to the loss of teeth. If your gums are bleeding inexplicably, are tender and sore or feel inflamed you should make an appointment with us immediately.